"Agatha Christie for people who inhale." Welcome back to the web site. If you're a first time caller, don't wait for the tea to be poured, set yourself up so that we can get started. 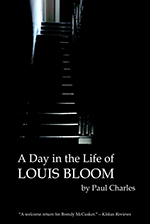 So this time we've got the 2nd book in the McCusker series, A Day in the Life of Louis Bloom, which is set in Belfast, to talk about. Also in the current edition of the Ellery Queen Mystery Magazine (Sept/Oct 2018 and out now) there is a new Christy Kennedy (short) Mystery, The Case of The Smoking Knife. It was great fun to write. I hope you enjoy. That's all for now. I need to get back to work on the 11th Kennedy mystery, Departing Shadows. Thanks a million to Catherine McGinley for the use of the PC photos. Site design © & maintenance by xuni.com. All content © 2009-2019, Paul Charles.